Besides storing documents, a binder is also an ever-present accomplice of office goers, students, and homeowners looking to be more productive and organized. There are many binders available in market which serve the purpose; however, if you are on the lookout for an assortment of colors and an durable paper storage and organization solution, the classic color one inch 3 ring view binder 4 pack assortment is the right choice for you. 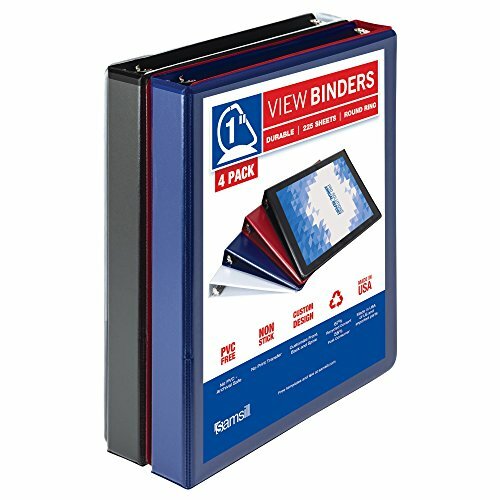 This durable view binder 4 pack comes in 4 basic colors (black, white, red, blue) that are perfect for organizing any project at home, school or work. Each view binder features a clear overlay on the front, back, and spine giving full control and flexibility over customization of presentations, organizational projects, office reports, class projects, and more. Order multiple binders to create a custom reference system for weekly or monthly office reports, multiple classes at school, or other unique personal or professional projects. Cover is made from polypropylene, offering increased strength and durability when compared to PVC. Polypropylene is also non-stick, which prevents transfer of ink or lifting copy when materials are inserted in the cover or placed inside. This makes it easy to reuse and update the covers and spines as often as you’d like. Polypropylene is tightly sealed over rigid chipboard made from 100% recycled fiber with at least 98% post-consumer content. Three 1 inch D-rings with double boosters can hold up to 250 sheets (8.5”x11” size) with ease. Rings are mounted on the back lid which allows pages to lay flat and prevent wear and tear of the documents. Also includes two clear inside horizontal pockets for additional storage and organization of loose documents and non-punched papers. Each pocket provides enough space to hold notes, photos, business cards, or full-size pages that will be punched later. Perfect for school, office or even managing your personal documents at home.